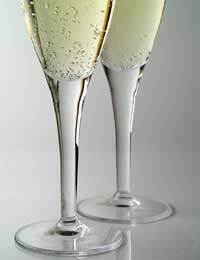 Despite Champagnes hold on the public imagination there are a many other reputable sparkling wine varieties that are enjoying a rising reputation. Sparkling wines are generally wines made by fermenting the product a second time whilst in the bottle. Following the development and perfection of this process in the Champagne region, many other areas of the world developed their own equivalents. Asti is a popular sparkling wine that has been produced in the Asti Region of Italy since the late 19th Century. Asti has a reputation as a very sweet wine, with low alcoholic volume. The production of Asti is based on the Champagne method of wine production, although Asti is made from the Moscato grape alone. Asti has suffered in reputation due to its mass production, although a good Asti has a complex fruity taste and is an ideal summer drink, served chilled. Cap Classic is a sparkling wine produced in South Africa to methods bought over by the French Huguenots, who fled France under persecution. The persecution Africans in South Africa meant that for many years South African wines went unrecognised. Now, however, efforts are being made to promote high quality sparkling South Africans. Cava is one of the longest running Sparkling Wine success stories, and is readily consumed as an alternative to Champagne, enjoying a similar status as a party drink. Cava was first produced in the Penedes region pf Spain, following a visit by the industrious Don Jose Raventos to the Champagne region. This soon led to the vintners of Penedes devising an ingenious plan – they would market their region as the Champagne region of Spain. Cava is regulated by Spanish law, and the majority of all Cava is still produced in the Penedes region in Catalonia. Its proximity to Barcelona makes it a drink associated with summer swinging, cultural finesse and the Latin temperament! Cava on the whole tends to have a bite unlike champagne, due in part to its dryness, and its citrus flavour. It tends to be made from three white grapes: paradella, xarel-o and macabeo. Chardonnay is incorporated in the famous Cordoniu blend. As mentioned elsewhere, English Sparkling wine is at the forefront of the English wine markets efforts to achieve parity with their European neighbours. Despite the longstanding tendency of the French and other winemaking nations to make disparaging comments about English wine, English sparkling is making headway. In 1997 a blind wine tasting competition in France left French tasters thinking they were drinking a French Sparkling wine, when, in fact, it was a Nyetimber 1992 Grand Cuvee! Prosecco is a sparkling wine made in the Vento region. It as a wine is protected, and very much respected as an alternative to Champagne. Its little known reputation make it affordable, and a higher class alternative to Italian Asti Wines. Sekt is a sparkling wine produced on a large scale in Germany. Sekt varies considerable in quality, and much that is consumed in Germany is of a poorer mass produced variety. Of these, some are made from German grapes (Deustscher Sekt) and these are generally of a better quality. Others are made from cheap blends of grapes imported from the rest of Europe. A very small percentage of quality Sekts are made from the finest weissburgunder and rulander (pinot blanc and pinot gris resectively), formulated especially for clarity and sharpness of taste.